Home/General/Should You Purchase an Oculus Go for Displaying Your VR Apps? Should You Purchase an Oculus Go for Displaying Your VR Apps? Oculus for Business — the commercial B2B version of Oculus Go — is just a few weeks from shipping. We thought we’d mark the occasion by helping clients answer a question we often get asked: Should you buy an Oculus Go? The answer obviously depends on a few things… What is your budget? Do you already own a different headset? What are you using VR for? How important is user experience to your VR audience? What is the quality (ie pixels) of the media you’re using to create VR? We’ll dive into those a bit below. But first we wanted to introduce you to the Oculus Go, if you haven’t tried one yet. It’s the new mobile, standalone VR headset from Facebook’s Oculus division. It competes with the Lenovo Mirage and (forthcoming) Vive Focus. You can read our comparison of the three by clicking on this link. The specs of the Oculus Go for Business are pretty impressive, with 2,560 x 1,440 display, 64GB of memory, and built-in speakers. The visual user experience is similar to Gear VR, with some notable improvements. And the expected cost of the B2B version of Oculus Go is only ~ $300 USD. What the Oculus Go can’t do: room scale VR. For that, you’ll need an HTC Vive or Oculus Rift. But for most of our clients, that’s not necessary. So should you invest the $300 for a commercial version of the Oculus Go? Let’s dig into the considerations, and hopefully by the end of this article you’ll be able to decide if it’s the right fit for you. Do you already own a VR headset? What are you using VR for? What media will you be displaying in the Oculus Go? 1. Do You Already Own a VR Headset? For a small group of users, the Oculus Go will be their first headset. Maybe they used one at a trade show and decided it would be perfect for use at their company. There are definitely some reasons to add the Go to your VR toolset, even if you’re in one of the aforementioned situations. Sure, the Go is 20-30x the price of Google Cardboard, but if you want to do a truly professional presentation, it’s just so much more impressive than handing a client a Cardboard. And the portability and ability to purchase multiple Gos make it superior to the Rift or Vive in a lot of corporate situations. Perhaps you got a Gear VR with your Galaxy phone… do you really need to invest in a Go also? The answer is likely “yes”. The distribution method (via Release Channels, with InstaVR Pro) and reliability are superior to the Gear VR. Plus, each Go will cost you $300, versus subsequent Gear VRs costing you upwards of $800 — $700 for the phone and $100 additional for the headset. Final Thoughts: Don’t think just because you already own a VR headset that Oculus Go isn’t a good fit for you. The immersion and clarity far exceeds Google Cardboard, the reliability and ease-of-use (no Signature Files!) outpaces the Gear VR, and the portability and cost make it more attractive than a Rift/Vive. So just because you already own one of those headsets doesn’t mean you also won’t benefit from purchasing an additional Go or fleet of Gos. 2. What Are You Using VR For? Your use case may dictate whether the Oculus Go is the right fit for you. Remember, the headset is completely standalone, can easily handle long-form 4K media, and is easy to distribute your InstaVR-created apps via Release Channels. That has a lot of value for specific industries. VR for Training: An area we just covered last week, that is likely the fastest growing use case in enterprises. The Go has a number of advantages in this space — it’s fully immersive (vs. Cardboard) so will make for more memorable trainings. It’s easy to distribute globally via the Release Channel feature. And at $300, you can buy considerably more of them than investing in Rift or Vive, which require high-powered computers and graphic cards. VR for Education: Schools are an obvious fit for Oculus Go. 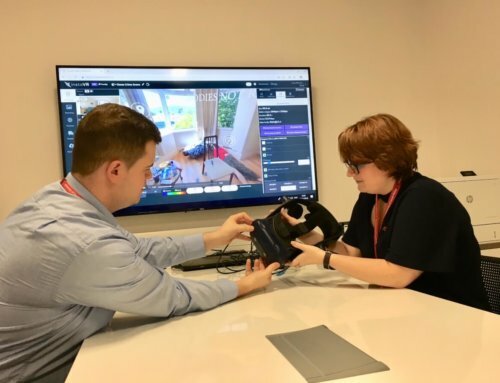 The portability and accessibility, combined with the price, means multiple departments can make VR apps using InstaVR and display them for educational purposes. VR for Sales/Marketing/Trade Shows or Events: This one is a no-brainer. The portability of the Go, without sacrificing quality, makes the Go a natural fit for presentations on the road. The commercial version of Go even comes with replaceable face guards (perfect for trade shows). Plus, potential clients will appreciate the softer, lighter headset vs. the Rift or Vive. Final Thoughts: The Go has applicability across many use cases. But it’s most appropriate when you need the mobility of a standalone headset, combined with: – A lower cost point than Gear VR/Rift/Vive – Ease of global distribution and – Quality of image and audio (built-in speakers!) that far exceeds Google Cardboard. 3. What Media Will You Be Displaying in the Oculus Go? If you’ve invested in a professional camera like an Insta360 Pro, you know you need a headset that will do justice to the 4K+ images or video you capture. If you’ve invested in a higher-end prosumer camera — ie the Nikon KeyMission, Garmin VIRB, GoPro Omni or Vuze — you should also invest in an Oculus Go headset. Why? Many phones simply can’t handle 4K video. And the ones that can, even if the media is stereoscopic, will not feel as immersive in the lower field-of-vision Google Cardboards or plastic knockoffs. If you’re using a Gear VR with 4K video, you’re going to quickly run down the battery and overheat the phone. Because InstaVR helps you to quickly author & distribute your VR applications, your biggest cost is really the time that’s spent capturing your images & video. So if you’re going to invest the time in capturing higher-end media, the $300 for an Oculus Go is well worth it. Even the most creative VR experience or educational training isn’t going to be as memorable or well-received on the wrong headset. So an investment of $300 per headset is worth it if you’re going to be capturing and displaying in 4K. The Oculus Go launch has already been a success. SuperData Research — perhaps a bit optimistically — expects 1.8 million Oculus Gos to be sold worldwide in 2018. The new commercial version, Oculus for Business, is a great fit for many companies. Both for if you need a single headset for a sales presentation or trade show, or if you need a whole fleet of headsets for a classroom or employee training. Obviously, the $300 price point is attractive. But don’t underestimate all the benefits — 64GB of space, crisp 4K resolution, built-in audio, ease of distribution through Oculus Release Channels, etc. Authoring an Oculus Go app using InstaVR is simple. Check out our guide for that, if you haven’t already. You can quite easily impress your employees, clients, and students without having to learn a line of code. The portability, comfort, and immersion of Oculus Go is truly impressive. Particularly when you take into account the price. If you’re truly serious about incorporating VR into your business, a combination of: a prosumer camera + InstaVR + Oculus Go is very powerful. With the prospect of millions of Oculus Go users in the near future, we want to make sure to give you the best platform possible to author and distribute your Go apps. Best of luck with your VR creation! Have any questions on the Oculus Go? You can ask us over Live Chat on weekdays, at our Thursday live trainings (10am EST at https://join.me/instavrandrew) or via our contact email.